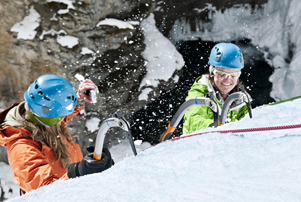 Experience an ice Climbing lesson for families, individuals and groups. 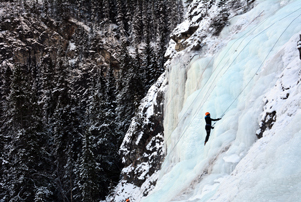 The best ice climbing in the world is found in the Canadian Rockies surrounding Banff, Canmore and Lake Louise. 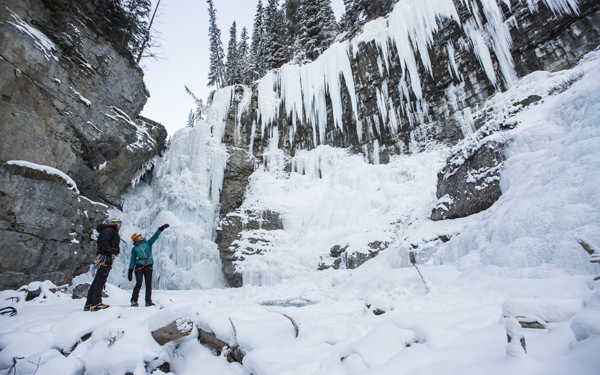 Waterfall ice climbing is an unbelievably exhilarating sport and we invite you to experience it for the first time with Yamnuska’s ice climbing guides. 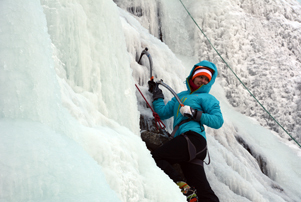 We offer full and half day ice waterfall climbing lessons for beginners. Experience this fun and active sport under the guidance and instruction of professionally certified guides. 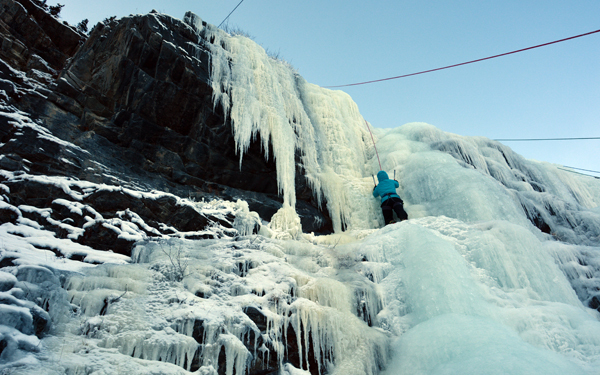 Our full and half day ice climbing lessons are ideal for groups or individuals. This is a fun family or group activity that is designed to challenge you but leave you wanting more ice! 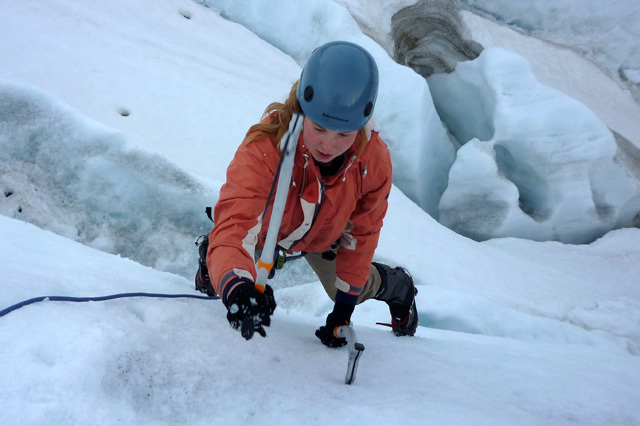 We provide all of the equipment so you just show up, get fitted with gear and we go climb some ice. 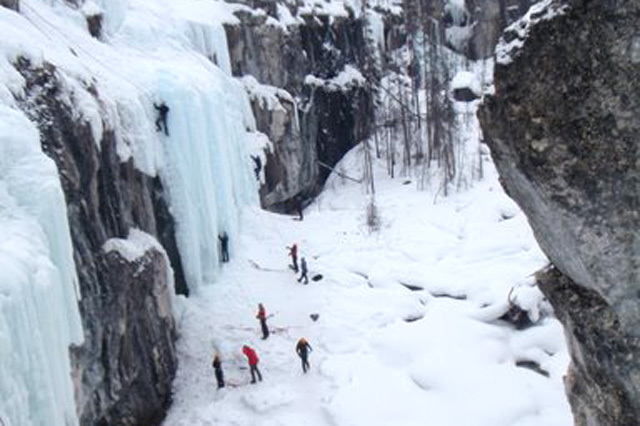 This ice waterfall climbing tour will appeal to anyone looking for an active winter adventure. We consistently hear that our ice climbing lesson for beginners from us is the highlight of a trip to the Canadian Rockies. Yamnuska guides and instructors are certified by the Association of Canadian Mountain Guides and are among the best in their field. In addition to technical excellence they are great communicators and coaches. They are members of a guiding team that shares current conditions and technical tips on a daily basis. Staff training and mentoring by our most senior guides ensures uniformly high standards for all of our guides. This is unmatched in the industry. Located in Canmore, Alberta in the heart of the Canadian Rockies Ice we have extensive experience as ice climbing guides for virtually every ice route in western Canada. Grassi Lakes: “The Junkyards” 10 minutes drive from Canmore followed by a 20 minute walk. A great spot for first time ice climbers and those wishing to brush up on skills. King Creek: 40 minute drive from Canmore in Peter Lougheed Provincial Park. Good beginner location for a full-day of climbing with some challenging short climbs to finish on. 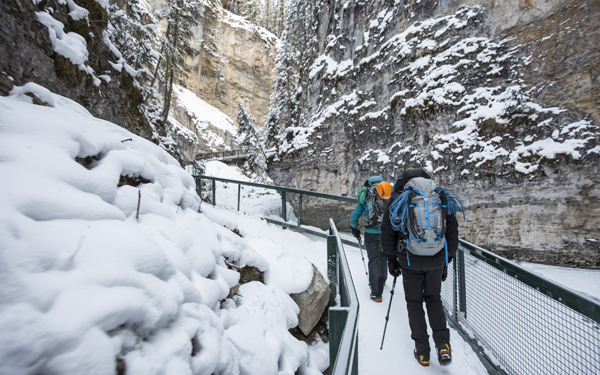 Johnston Canyon: 20 minutes drive west of Banff. Good for steep ice climbing practice. Haffner Creek: 40 minutes drive west of Banff. Excellent variety of steeper climbs and mixed climbs. 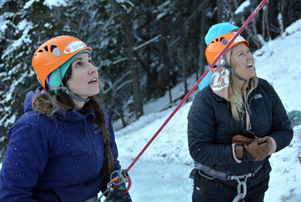 The “Yam Ice Team” includes some of the best ice climbing guides and instructors anywhere! Enthusiastic and extremely talented, they hold climbing certification from the Association of Canadian Mountain Guides and from other International Federation of Mountain Guide Association (IFMGA) countries. Your safety and enjoyment are paramount to them. Unless otherwise specified we will meet you at the Yamnuska office at 200, 50 Lincoln Park, Canmore. See this map for location. The meeting time will be set when you make your booking. Generally half day programs begin at 7:30am and 12:00pm. Full day programs begin at 7:30am. Transportation is not usually included but may be available on certain days. Clients generally provide transportation for the guide. If there is a vehicle available, Yamnuska can provide transportation for a pick-up in Banff ($75) or Canmore ($50) with additional fuel surcharges being added on for climbing locations anywhere other than the “Junkyards”. For larger groups requiring a 15 passenger van transportation charges will be greater. Please inquire with the Yamnuska office staff. For insurance reasons guides cannot transport clients. We suggest you rent a car while in the area. If a guide has to drive beyond Canmore to meet you for the climb additional fuel charges apply. Most people stay in Canmore if here to ice climb, this is most convenient. Otherwise you can stay in Banff or Lake Louise. In this case you will be charged for the guide’s gas expenses for driving to meet you. These are not included save by special arrangement. Make sure you bring plenty of high-energy snacks plus plenty to drink. A Thermos with a hot drink is a good idea. Technical equipment is included in the price. There can be periods of inactivity in very cold temperatures. Don’t be afraid to bring too much! We suggest bringing light clothing of varying thicknesses that can be ‘layered’ to achieve comfort and versatility. The most important consideration for clothing is the ability to regulate temperature as you change from periods of activity to periods of rest. Cotton clothing is not appropriate as it causes rapid heat loss when wet. Ski wear works well. Long underwear (top & bottom), synthetic or wool. Waterproof climbing gloves &/or mitts plus spares. Daypack (large enough for spare clothing, your lunch & climbing gear e.g. rope & crampons). To book guided climbing you must call or email our office. Registration requires a deposit of 35% of the cost or, for trips of three days or less, full payment. Please note that you will be required to sign our waiver before commencing the program. Please view our sample waiver copy. When hiring an ice climbing guide we can quote you for the following costs: guide fees, transportation, and park entry fees when applicable. In addition we may be able to price local accommodation, your lunches and snacks. Goods & Services Tax & gratuities not included. Our basic rates include guiding fees and gear only. Our cutting edge equipment is selected to best enhance your experience. Key items are replaced annually with the latest models. 6-7 hours climbing with modern gear included (boots, crampons, ice tools, harness & helmet). GST is extra. 3 hours of climbing with modern gear included (boots, crampons, ice tools, harness & helmet). GST is extra. “Junkyards” location only. Please advise us of the age of any minors in your group. Depending on age and height/size we may not be able to accommodate very young children. We can generally accommodate children 10 years of age and older when accompanied by a parent. Minimum shoes size must be men’s size 5 (Euro size 35). 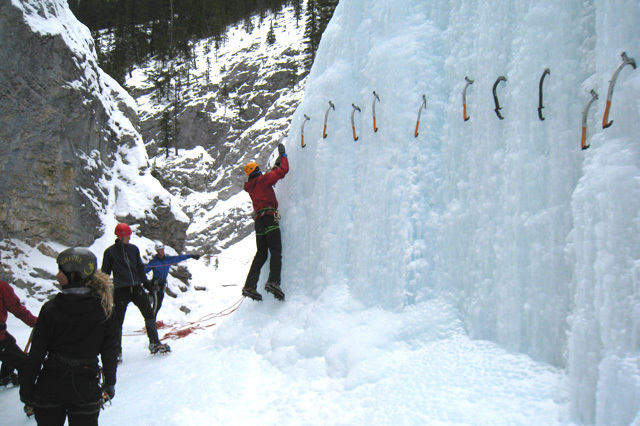 Yamnuska guides and instructors are also available for any private ice climbing trips.